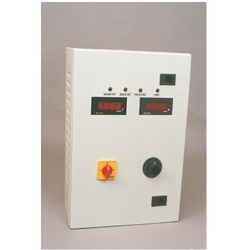 We are highly instrumental in manufacturing, exporting and supplying of superior quality Analog DC Drive for Winders. These products have extensive uses in industries for different manufacturing machines such as slitting, lamination and wire drawing machines. Our offered products are rigorously inspected under strict quality norms for manufacturing defect free products. Our wide range under different specifications has enabled us to serve vast clientele base. 10 turn potentiometer for higher setting accuracy. Auto synchronisation with main drive. Supported by our punctilious professionals, we are engaged as manufacturer, exporter and supplier of Economy Box Drive. Our offered products are used for various machining processes in various industries. Due to utilization of finest quality materials with advanced machines, these products have high strength and precise finishing. We provide these products in various designs and specifications for serving diverse needs of our customers. Speed setting potentiometer on front panel. Settings: Max. speed, Min. speed. 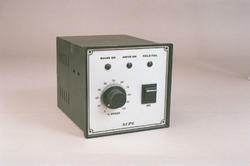 Protections: Field fail, Field and Armature fuses. LED Indications: Mains ON, Drive ON, Field Fail. Loop Control System can fit in the same box for bag making machine. Rotary ON / OFF switch. 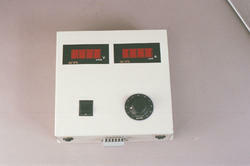 Any two Digital displays of voltmeter/ammeter/RPM meter. Settings: Current limit (CL), Current trip (CT), IR Compensation, Max. speed, Min. speed, Gain and Feedback. Protections: Current limit (CL), Current trip (CT), Field fail, Fuses for Field & Armature (Input & Output). 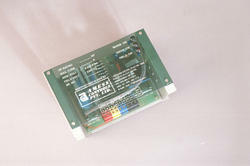 LED Indications: Mains ON, Drive ON, Field Fail, Trip. Full wawe full control (FWFC) / Full wawe half control (FWHC) Control card + Field card + Transformer card + Thyristor bridge (Mounted on a heat sink(s)), shunt all on an open chassis plate with an acralic cover on top with easy mounting holes. Settings: Current limit (CL), Current trip (CT), IR Compensation, Max. speed, Min. speed, Gain, Feedback, Acceleration and Deceleration. Protections: Current limit (CL), Current trip (CT), Field fail, Phase sequence. 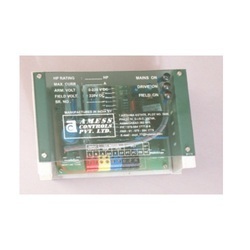 LED Indications: Mains ON, Drive ON, Field Fail, Phase Sequence. Size: As per drive HP. Drive card fitted on an open chassis plate with an acralic cover on top with easy mounting holes. Setting: Max. speed, Min. speed.